This is a ticket that allows to board and disembark at any station on the entire Enoden line any number of times during one whole day. You will be able to receive many special benefits at Enoden wayside facilities, so be sure to enjoy your Enoden trip with “Noriorikun”. * Only valid on the date of issue. Because this is a discount ticket, it cannot be combined with other discounts such as group discounts or discounts for disabled persons. 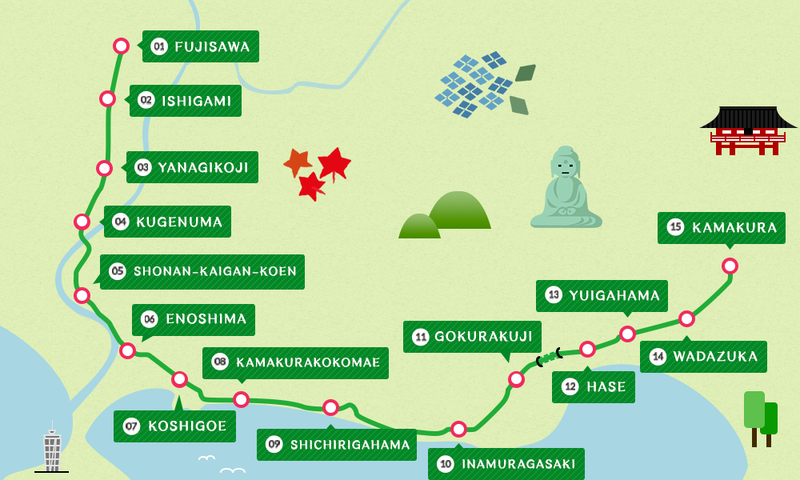 Enoden 1-day pass ticket “Noriorikun”can be used in the following area. Special benefits such as discounts are available at Enoshima Sea Candle, Enoshima Aquarium, and Hasedera Temple, as well as more than 20 lodging facilities and restaurants. * Special benefits are valid only on the “Noriorikun” valid date. * The special benefits offered by each facility can be used only once by each “Noriorikun” pass holder. * “Noriorikun” passes cannot be refunded following travel start.